I didn’t really expect much from Iron Cast. It’s one of those books where its cover caught my eye while browsing Goodreads one day, and the description sounded interesting enough that it led me to add it to my to-watch list. Afterwards though, I must admit it’d pretty much flown out of my mind— that is, until one day I read a very positive review from Kaja whose blog I follow, and her praise was enough to put this book on my radar again. 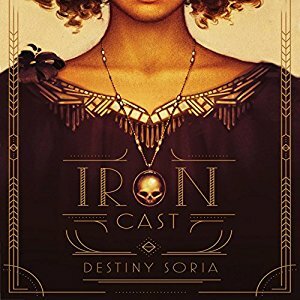 When the opportunity to review the Iron Cast audiobook came along, I jumped on it, and I am very glad I did. The story is a historical fantasy that takes place in Boston. The year is 1919 and the city’s club scene is full of life, even as the country teeters on the cusp of the Prohibition Era. In underground venues all over, hemopaths entertain patrons on stage. They are the “blood afflicted” ones, gifted—or cursed, depending on your point of view—with the ability to create illusions and affect emotions through art. Best friends Corinne and Ada are two such talented individuals, employed at Johnny Dervish’s Cast Iron Club. By night, Corinne recites beautiful poetry while Ada plays mesmerizing tunes on her violin, but by day, the two young women work their magic as con artists. Our protagonists aren’t exactly proud of what they do, but it’s a rough world out there for hemopaths and they have to take certain measures to keep themselves and their families safe. Ada and Corinne rationalize that they are cheating and stealing only from the people who deserve it, using the funds to hide the secret of their abilities and what they do for Johnny Dervish. Hemopaths using their abilities is illegal, and those captured are taken to institutions where inhumane experiments take place on prisoners under the pretense of rehabilitating them and making them “fit” to enter society again. One day after a botched job, Ada finds herself thrown into one such place, the nightmare that is Haversham Asylum. Corinne manages to break her out, but upon returning to the Cast Iron, the two of them discover to their horror that even worse misfortunes have befallen their friends at their beloved club. In many ways, this book reminded me of a lot of Lee Kelly’s A Criminal Magic, another novel I read this year about illegal sorcery as a form of entertainment in clandestine nightclubs, which also takes place around this historical time period. While I enjoyed that one quite a bit, I do think Iron Cast managed to handle several elements with a lot more flair and energy. First of all, the setting: Destiny Soria really captured the essence of 1919 Boston in her descriptions of the people and places, from the poor and downtrodden in the urban tenements to the glitz and glamour of the city’s elite. It’s also an era of tumultuous politics, which is subtly but unmistakably reflected in the social climate portrayed in the story. The nature and soul of the time and place is so important for me when it comes to historical fiction, and in my opinion, the author nailed it. As I listened to the audio, I could practically feel the atmosphere oozing from every word. Second, I adored Soria’s approach to the theme of female friendship. I know that’s a term that gets thrown around a lot, especially in YA where perhaps more readers are seeking out stories that feature strong friendships as a counterbalance to the genre’s heavy emphasis on romance. I’ve been drawn to books before that claim “female friendship” only to be disappointed the moment a guy steps in and overshadows that relationship (Truthwitch is an example that immediately comes to mind) so you can understand why I went into this one with no small amount of skepticism. Thankfully, those turned out to be unfounded. Corinne and Ada are indeed the best of friends and the strength of their bond was apparent from the get go. The two of them come from very different worlds—Corinne’s parents are prominent and wealthy members of the Boston elite and her brother is running for political office, while Ada is the daughter of two hardworking but impoverished immigrants and her father has been jailed for a crime he did not commit. It may seem like a cliché for two girls from such different walks of life to bond over their shared hemopathy, but there’s so much more to their friendship than that. Corinne and Ada provide each other comfort and support, but each character also shows time and time again that she is willing to put the other’s safety and happiness above her own. That unconditional love means that they are aware of each other’s foibles and they even joke about how they drive each other up the wall—but all it does is make that loyalty stronger. All told, I thought this was a great novel and a rather happy surprise. The audiobook was a great way to experience the story, with Christine Marshall’s narration bringing to life all the beauty and magic of Boston in the post-WWI era. I enjoyed her accents and intonations for the various characters and the way her smooth reading kept even the slower, more understated parts of the story moving along at a smart pace. A fantastic debut and highly recommended. Historical fantasy is always a fascinating subject, but when it’s done – as you write – with great accuracy in painting the historical/social background of the era, it has the potential to turn our into a great story. I will certainly add this one to my “next” list, thanks for sharing! It was a pleasant experience, I do like to listen to YA in audio. I like the way this sounds!! And yay for it being a story with actual friendship!! Ooh, good to hear about the immersive historical atmosphere! That alone can make a book worth reading. The cover totally got me, too. I really like the sounds of this one, especially the setting and the focus on friendship between girls. And the cover’s beautiful, too. I’m guessing it might also be a good book for anyone looking for diverse characters? I think you’d find this one enjoyable. And yes to your last question! Hmmm, I love the cover. I might have to look out for this! Yep, it bears repeating, it is a gorgeous cover. I was the same! Hadn’t really paid much attention to this book, until I saw a great review on a friend’s blog. I looked forward to checking it out after that. Oh wow. This sounds great – I love the idea of the era and the setting and it sounds like a great story. A bit like you, the cover drew my eye a while ago but then I kind of forgot about this one. I will have to put it back on my list. Ahh this is why I love reviewing books. You read it and now your readers will read it and the word spreads about a lovely book! 🙂 I’m really glad you liked it! The worldbuilding was really great, I agree. I haven’t read many books set in that era and it came to life through Soria’s writing. And yeah, the friendship is what made this book so great. Apart from Uprooted, I don’t remember reading such a great relationship in the past couple of years. I thought this may be the start of a series but I can’t find info anywhere. I’d love to read more about Corinne and Ada! Yep, it was a great book Kaja! And I probably would have taken much longer to get to it had it not been your review, or who knows if I would have read it at all. Thanks so much, and I hope I can pay it forward by encouraging others to check out Iron Cast. I’m hearing nothing but love for this one and need to read it sooner rather than later. e Alt-histories and/or mash ups of historical fiction and fantasy = the best!